CENER´s image. 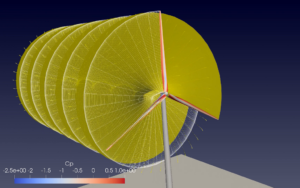 Modelling of a virtual 10MW wind turbine (AVATAR project) using a coupling of AdaptFoil3D and OpenFAST (NREL). The national technology centre will participate in the exhibition with its own stand (1-F52), in addition to producing oral presentations and posters. WindEurope 2019 will take place at the Bilbao Exhibition Center between April 2nd and 4th. Specifically, CENER researchers will present two papers and 4 posters at the conference and will coordinate a workshop. The workshop, which will be held on Tuesday, April 2nd, will deal with the European NEWA project (ERA-Net Plus NEWA number 618122), will be coordinated by Javier Sanz (project coordinator in Spain) and Roberto Chavez will also participate. The two papers will be presented on Wednesday, April 3rd: Roberto Chavez will talk about a new method of coupling mesoscale and microscale models for the evaluation of wind resource, and Álvaro González will talk about digital copies of wind turbines for the management of his useful life. In addition and as usual in this type of congresses, posters will be shown with explanations by responsible researchers. In the case of CENER, are 4 in total. On Tuesday, April 2nd, José Azcona will comment “Scaled wave tank hybrid testing of the TELWIND Floating platform for a 5 MW wind turbine”. On Wednesday Beatriz Méndez will also intervene with the “New low-drag vortex generators concept”.and Álvaro González will present “Development of a panel code and integration into OpenFAST” and also the poster “Digital twin of a real wind turbine: development and validation”. In parallel to the congress the exhibition is celebrated, in which CENER participates with a stand (F1-52), where some of its main proposals will be shown around four main areas: wind resource assessment, aerodynamics, structural design, and management of wind farms, including their life extension. Every day of the event, oral presentations will take place at the stand. In the area of ​​wind resource assessment, CENER has designed a tool that uses Computational Fluid Dynamics (CFD) technology together with the computational cloud, and the latest results of the European NEWA project (ERA-Net Plus NEWA number 618122), whose main objective is the realization of a wind atlas in Europe that will include the state of the art in the modeling of the wind resource, as well as the generation of an experimental database created from intensive measurement campaigns. CENER is the project coordinator in Spain. In addition, the proposed innovations in aerodynamic design and the improvement of the efficiency of wind turbine blades will also be presented at the stand. Regarding structural improvements, CENER proposes an innovative solution for the modular union of the blades, as well as new testing methods for offshore wind platforms. The management of wind farms and their extension of useful life is another main issue that will lead CENER to Bilbao, proposing different strategies for different types of turbines within the same wind farm, thus optimizing the assets. As expected, the Wind Turbine Test Laboratory will also have a special role at the stand of CENER in Wind Europe 2019, which will be located in Hall 1, F1-52.